The Dutch audio innovators showcased a wealth of evolutionary audio solutions, based around the company’s patented Pro-Ribbon transducer technology. On the stand, visitors were presented the recently introduced QR24 pro-ribbon line-source column, enabling full-range high SPL HiFi sound quality in acoustically-challenging rooms without the necessity of DSP-based beamsteering. Also the award-winning BC332 compact cardioid subwoofer, which cancels the sub frequencies on the rear of the cabinet, was presented. With the first beta program finished and the Launch Partner Program started, the LR24 mid-sized pro-ribbon line array system enjoyed the attention of many, interested in "HiFi at concert SPL’s". subwoofer, both driven by the 4-channel Sentinel high-end amplified loudspeaker controller. But the real show stopper was definitely the 2013 design study, called "SheiQ2"; This 3-way system was developed to research a scalable club system form for obtaining an extreme headroom SPL, natural sound reproduction with excellent arrayability, throw and coverage control. With a height of 100cm/3ft, the symmetrically laid-out system contains no less than 14 transducers; The mid/high section alone, consisting of two 18" pro-ribbon transducers with a 90-degree x 3-degree dispersion, has a power handling of 6.000W from1kHz to beyond 20kHz. The frequencies below 1kHz are taken care of 6x 6.5" MF and 6x 12" LMF, both sections vented. If needed, multiple cabinets can be connected in the vertical/coupling plane to create even higher SPL output and tighter control at lower frequencies. Many enquires were received for a finished product, which could speed-up the time-to-market for this research project. "The amount of interest the products received and the ongoing global distribution expansion, are clear signs that Alcons systems are really bringing something new and evolutionary to the industry," says Alcons Audio managing director, Tom Back. "the Alcons Audio team, both the employees as well as the worldwide Pro-Ribbon Partners, is doing a tremendous job in bringing innovative pro-ribbon based solutions to the market. And it’s great to see this growing Alcons family gather at the annual "Alcons Frankfurt dinner" on Thursday. Good fun and a great show!" 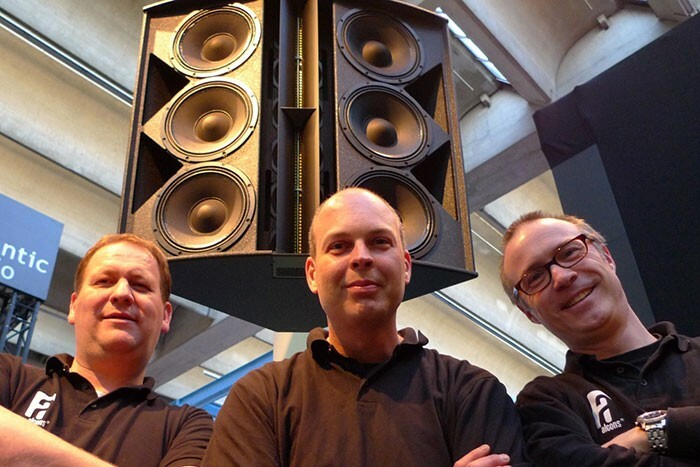 In picture: Alcons Audio colleagues Carsten Albrecht, Niels Janssen and Tom Back in front of the SheiQ2 design study.